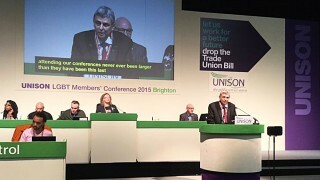 Conference condemns the Tory Government’s sustained attack on the rights of public service unions and workers – rights guaranteed under International Labour Organisation (ILO) conventions. The undermining of the rights of trade unionists violates civil liberties and human rights including the freedom of association and assembly. Conference is therefore not surprised but is appalled that the Conservatives are intending to repeal the Human Rights Act (HRA) and replace it with a ‘British Bill of Rights’. This, like the Trade Union Bill, is an ideological attack on our rights and freedoms. Workers rights and human rights are inseparable. We had to fight to win them, and now we must fight to defend them. The Tories argue that a British Bill of Rights will ensure that the European Court of Human Rights (ECtHR) will no longer be able to overrule judgements made in British courts and will make “the Supreme Court supreme”. However, for LGBT people, it has been necessary to use the ECtHR to win equality including decriminalisation of homosexuality, the right to marry, gender recognition and the right to be treated equally at work. Shami Chakrabarti, director of human rights group Liberty, told the Daily Mirror that the proposal to scrap the HRA “is the gravest threat to freedom in Britain since the Second World War.” Some rights may be limited and could be overturned such as the right to privacy or family life and appealing to the ECtHR would be lengthy and difficult. 4. Publicise information on the relevance of the HRA to trade unions, employment and equality.